Thanks for putting my Stapes drill on Blog. It is reusable and handy.The cells inside used ae easily available and about more than 100 ENT surgeons of India and abroad are using my drill including Dr Mariosana Italy, Dr morwani,Dr Kirtane, Dr sandra desa, Dr Kameswaran and so on....The cost is only 12K with bill. 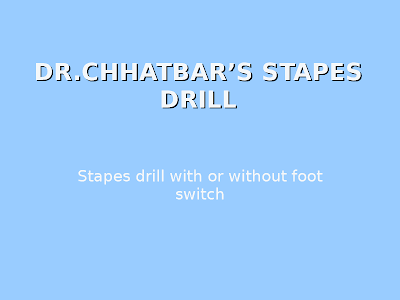 Dr Kalra of Amritsar is using my Stapes drill and Debrider both since more than 3yrs.